Figure 1: A catshark pectoral fin and a mouse forelimb. (a) Skeletal pattern. In a catshark fin, three basal bones are connected to the pectoral girdle, whereas in a mouse limb, a single basal bone is connected to the body trunk. (b) Expression patterns of genes involved in anterior-posterior patterning of fins/limbs. The balance of anterior field (Alx4, Pax9-positive region) and posterior field (Hand2-positive field) shifted in between a catshark pectoral fin and a mouse forelimb. A study of catsharks reveals how alterations in the expression and function of certain genes in limb buds underlie the evolution of fish fins to limbs. The findings are reported by researchers from Tokyo Institute of Technology (Tokyo Tech), the Centre for Genomic Regulation (CRG, Barcelona) and their collaborators in the journal eLife and give new insight into how fish evolved to live on land in the form of early tetrapods. The first four-legged, land-living creatures – known as early tetrapods – evolved from fish, following the transformation of fins into limbs. This fin-to-limb evolution is a crucial, yet so far unsolved, example of how morphological changes can dramatically alter life on Earth. Now, researchers at Tokyo Tech and CRG, together with scientists across Japan and Spain, have revealed how genetic alterations governing the patterning of skeletal structures in fins may have led to the evolution of limbs and the rise of early tetrapods. The forelimbs of tetrapod evolved from the pectoral fins of the ancestral fish. These fins contain three or more basal bones connected to the pectoral (shoulder) girdle. However, the most of basal bones located in the anterior side (i.e. the thumb side in the human limb) were lost in early tetrapods, and only the most posterior bone remained as the "humerus (i.e. the upper arm of humans)". Pectoral fins of catsharks also contain three basal bones as seen in the ancestral fish (Fig. 1a). 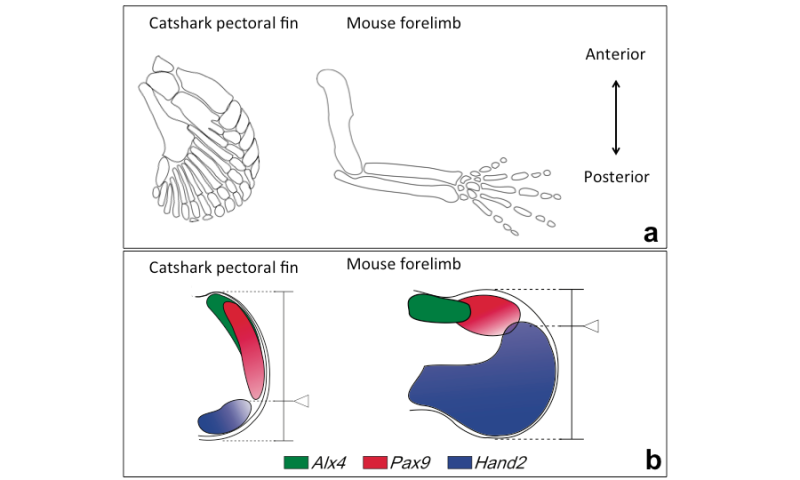 Thus, the team examined the fin development of catsharks, and revealed that there was a shift in the balance of anterior (thumb side) and posterior (pinky side) fields in their fin buds compared to that in mouse limb buds (Fig. 1a). A key regulator protein controlling the balance of anterior and posterior fields of limb buds of tetrapods is Gli3. This protein is expressed in the anterior part of limb buds, and regulates the expression of a number of genes providing cells with information about their position along the anterior-posterior axis. For example, Alx4 and Pax9 are expressed in a small area of the anterior part of the limb bud, while Hand2 is expressed in a large area of the posterior field (Fig. 1b). To determine whether shifts in the balance of anterior and posterior field occurred during fin-to-limb evolution, Onimaru and his colleagues carefully compared the expression, function and regulation of genes involved in anterior-posterior patterning in pectoral fins of catsharks, with those of mice. They found that, in pectoral fin of catshark embryos, Gli3 expression was intensified posteriorly, and the balance of the anterior and posterior fields was shifted (Fig. 1b). This indicates that a major genetic shift (posteriorisation) occurred as tetrapods evolved. Furthermore, they found that the catshark genome lacked a sequence found in mice and other tetrapods, which is responsible for preventing Gli3 expression in the posterior part of tetrapod limb buds. As a known repressor, the restriction of Gli3 to the anterior may result in the loss of skeletal structure in this domain. When the researchers experimentally "posteriorised" pectoral fin buds of catsharks, the fins lost anterior skeletal elements, and showed a single bone connected to the pectoral girdle, as seen in fossil Tiktaalik pectoral fins (Fig. 2). Figure 2: “Posteriorised” catshark fins. In control fins (left), Hand2 is expressed in the posterior margin, and three basal bones (ppr, pmr, pmt) are connected to the pectoral girdle. Whereas in “posteriorised” fins (middle), expression of Hand2 is extended anteriorly (arrowheads). In the severe case, a single basal bone is connected to the body trunk and number of distal radials is reduced. Interestingly, a fossil sarcopterygian Tiktaalik also had a single basal bone (humerus). These results suggest that one of the key genetic events during the fin-to-limb evolution was a shift of the balance of the anterior and posterior fields (a "posteriorisation") and loss of anterior skeletal elements (Fig. 3). Further research involving genome-wide studies, particularly into the role of Gli3, will help explore these results more fully. The earliest land-living creatures evolved from ancestral fishes, when fins transformed into limbs. Determining precisely how early tetrapods evolved, and in particular how fin-to-limb transformation occurred, has long proven difficult for scientists. During limb development, the embryonic cells are allocated and determined for specific roles and positions, gradually building a correctly-formed limb. Part of this process includes so-called 'anterior-posterior patterning' – the determination of where individual parts of the limb bud develop along the anterior-posterior axis (thumb-pinky axis). Previous research had divided the skeletal elements of shark pectoral fins into three parts along the anterior-posterior axis. In lobe-finned fish and tetrapods, however, two of the three segments – the anterior-positioned ones – had disappeared. This suggested that anterior-posterior patterning, and the genes which determine such positioning of skeletal elements, may play a key role in fin-to-limb evolution. 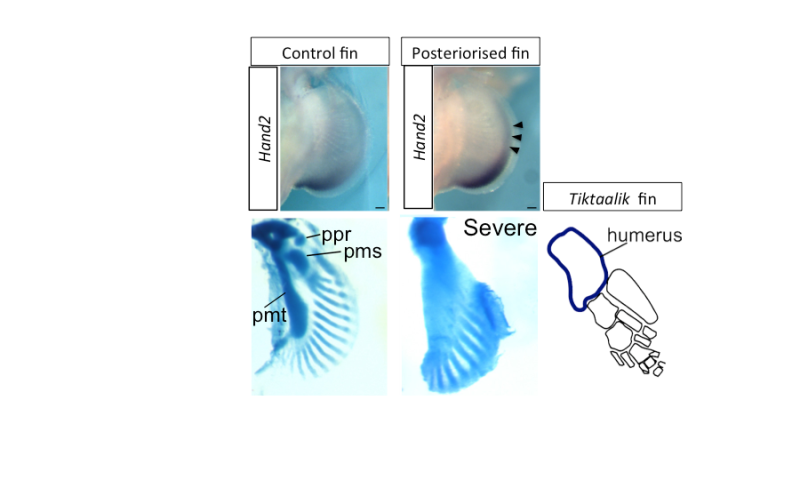 A key anterior-posterior patterning gene is Gli3 – a transcriptional factor which is known to control genes involved in creating fingers and toes, although little is understood about its full role in skeletal patterning of fins and limbs. Given its link to skeletal patterns, determining the exact role of Gli3 is an important future goal for scientists, and may prove invaluable in understanding fin-to-limb evolution. To determine how fins evolved into the limbs of four-legged land-living creatures, Mikiko Tanaka and her team used the latest genetic technologies to precisely track the expression, function and regulation of key anterior-posterior patterning genes in the fin/limb buds of both catshark and mouse embryos. They were then able to compare the fish and tetrapod genetic patterns, and uncovered a key difference between them in terms of fin/limb development. They analysed expressions of anterior-posterior patterning genes, and found that the anterior field was larger in catshark fins than in mouse limbs. Then they found that the shift of the balance of the anterior-posterior field was caused by changes in transcriptional regulation of a key anterior-posterior patterning gene, Gli3. When Onimaru experimentally posteriorised the catshark fins, the resulting fins lost parts of their anterior skeletal elements and showed a single basal bone connected to the pectoral girdle. Future work involving systematic genome-wide studies would help expand on the current research. As mentioned, little is known about Gli3 regulation, even in mice, and so systematic studies of the precise genetics behind the development of limb skeletal structure is needed.